In light of the ongoing discussion about Colt McCoy’s concussion and whether or not he should have gone back into the game last week against Pittsburgh, we’ve discovered one more thing that team president Mike Holmgren needs to add to his off-season checklist to go over with coach Pat Shurmur. Shurmur didn’t come off very well on Monday when addressing the media on the circumstances surrounding McCoy’s injury. Well as long as it’s clear what everyone does. We still don’t think Shurmur is lying about what happened Thursday night, nor do we think that the Browns intentionally broke any rules or willingly put McCoy at risk. Shurmur probably should have erred on the side of caution with McCoy, but if he kept him out and McCoy would have questioned the move afterward, it would have been more fuel for the anti-Shurmur crowd. Shurmur was focused on the game and relied on his medical staff; if he had ignored what was happening on the field and attended to McCoy instead, people would have criticized him for that as well. But Shurmur needs to be able to explain the situation more clearly – especially if the Browns have nothing to hide. With the benefit of hindsight, it’s clear that everyone involved made a mistake; just own it, there’s no shame in that. 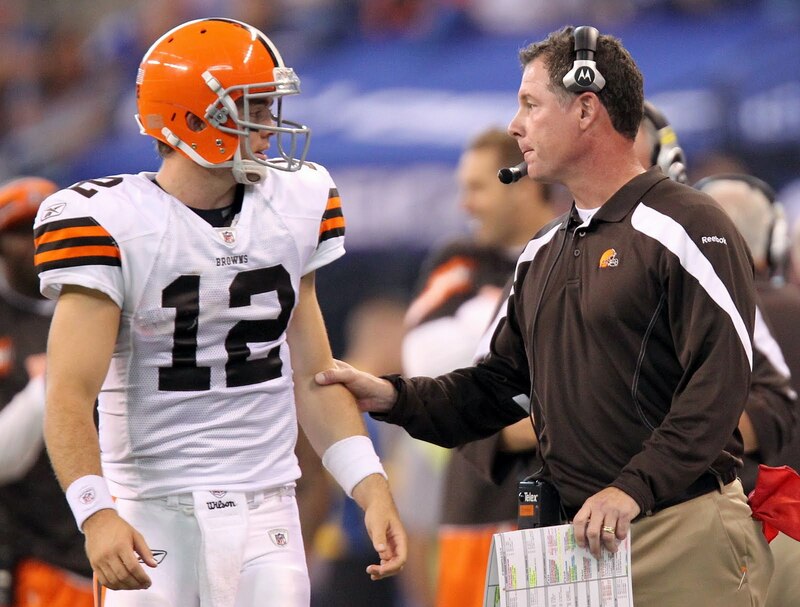 Shurmur is still growing into the job as head coach, which includes dealing with the media. He doesn’t come across as someone who would outright lie about something this serious, but he has to do a better job when he’s questioned about things. Peter King had some pretty strong thoughts on Colt McCoy in his weekly Monday Morning Quarterback column at SI.com. Finally, Brian Daboll is the NFL’s Typhoid Mary, as his crappy play calling as an offensive coordinator got his head coach fired for the second year in a row. One game is not enough. I guess the steelers have the the commish in their pocket! !